President Muhammadu Buhari has ordered the Inspector General of Police, Ibrahim Idris, to suspend the investigation of Sen. Ademola Adeleke, the Peoples Democratic Party (PDP), Osun governorship candidate in the Sept. 22 election, on alleged exam malpractice. 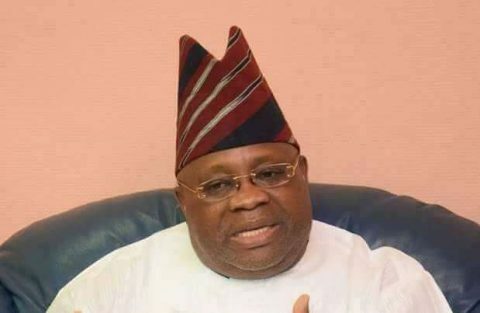 The I-G had on Sept. 19 summoned Adeleke and four others to report to the police Special Investigation Panel at the Abuja headquarters for arraignment in court. He and the other suspects will face a charge of examination malpractice, criminal conspiracy, impersonation. But, a source in the presidency confirmed to newsmen that President Buhari had ordered the I-G to stop the invitation of the PDP candidate until after the Sept. 22 governorship election in Osun. “The President has ordered that Adeleke should not be invited until after Saturday’s election,’’ he said. The Police Public Relations Officer, Ag. DCP Jimoh Moshood, had in a statement invited Adeleke and four others namely; Mr. Sikiru Adeleke, Alhaji Aregbesola Mufutau (Principal of Ojo-Aro Community Grammar School, Egbedore LGA, Osun State), Mr. Gbadamosi Thomas Ojo (School Staff responsible for the registration of candidates for NECO), Mr. Dare Olutope (School Teacher, who facilitated the commission of the crime) to report to the Special Investigation Panel, Force Headquarters, Abuja immediately for arraignment in court. The Police statement read: “ On 21st July 2017, the Osun State Police Intelligence Bureau (SIB) received and acted on an actionable intelligence about an ongoing examination malpractice involving Senator Ademola Adeleke and Sikiru Adeleke at Ojo/Aro Community Grammar School in Osun state. “Further investigation revealed that both Senator Ademola Adeleke and his brother Sikiru Adeleke registered and were sitting for the National Examination Council Examination (NECO) 2017 as internal candidates impersonating students of the School at the ages of 57years and 42years respectively. “This crime was facilitated by the principal of the school, and two other members of staff of the school for which they are under investigation and being charged to court. “However, Police investigation revealed the following primafacial and culpability facts against Senator Ademola Adeleke and four (4) others. “Senator Ademola Adeleke in the NECO 2017 Result obtained by the claimed that he was born on 12th June 1997 but in his statement to the Police, senator Ademola Adeleke wrote 13th May 1960 as his Date of Birth. “ Senator Ademola Adeleke and four others were arrested, investigated, granted bail and being charged to court. “Charges of Examination Malpractice, Criminal Conspiracy, Personation, Breach of Duty, Aiding and Abetting against Senator Ademola Adeleke (PDP Governorship Aspirant in the 22nd September, 2018 Gubernatorial Election in Osun State) and four (4) others namely; MR Sikiru Adeleke, Alhaji Aregbesola Mufutau (Principal of Ojo-Aro Community Grammar School, Egbedore LGA, Osun State), Mr Gbadamosi Thomas Ojo (School Staff responsible for the registration of candidates for NECO), Mr Dare Olutope (School Teacher who facilitated the commission of the crime) have been filed at the Federal High Court, Abuja under the Examination Malpractice Act, CAP E15, 2004 today, Wednesday, 19th September, 2018.